As we all know, social media is a great source of communicating between friends and family. Apps like, Instagram, allow friends from far away to stay up to date with what you are doing day to day via photos. Why not use the same idea for your wedding? Enter Wed Pics App, an app that you download to your phone and with a special code, all your guests can upload photos from your big day, leaving you with an album full of crazy memories through the eyes of your closets friends and family. You will receive a unique access code for inviting unlimited guests to your private photo album. This lets them view the real-time photo feed, add photos, and interact with others at the event. Your wedding dashboard features an easy invite system, allowing you to share your access code with friends and family via facebook or email. Order custom invite cards for inserting with wedding invitations or placing on reception tables. Step 3: Enjoy your album! 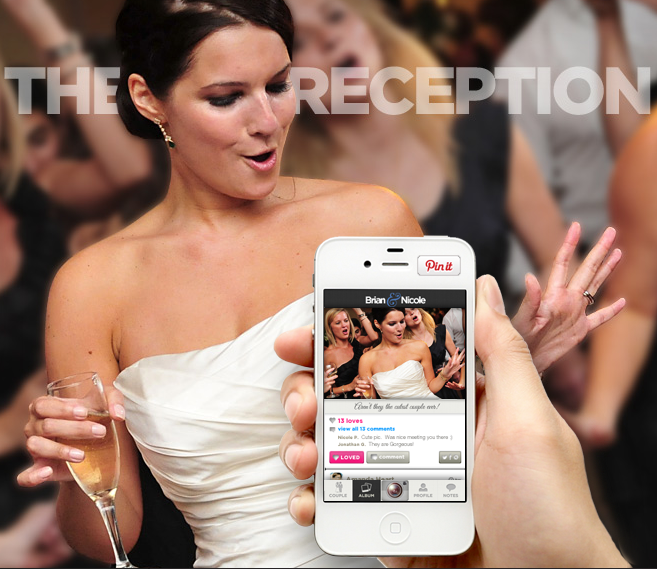 Your guests' photos, comments, and interactions are all displayed in your WedPics album, both in your app and on the web! No smartphone? No problem. Photos taken with digital cameras can be easily uploaded after the event.